Its a girl. The nose is pink if its a girl and Blue/purple if boy. That,s how I recenise them. Could change at that young age. Careful with the name choice. We have had our bird for 6months (T.Rex) and now his cere is crusty beige. We thought HE was a boy and now we think he is a girl. Hmmm - any blue on the cere tends to suggest a male bird although real lutino males have a flesh coloured cere and females have a brown one. At least, that's what is says in my budgie book! I've got a lutino and I'm pretty sure it's male. white around the nostrils is usually a clear sign of a hen. 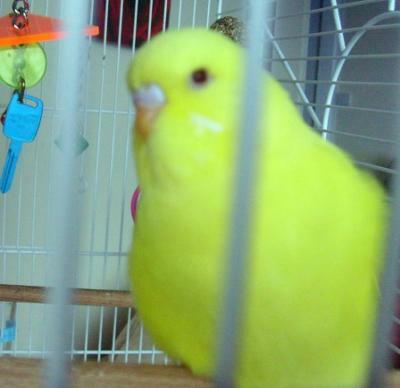 if it is a male the cere will stay flesh coloured, if a hen it will go brown. I'm not sure if it is a male or a female. from your description i would call her lucy!